Songwriter and performer Dan Bern adds the finishing touches to room 3D at the Carlton Arms in New York City three years ago. Bern first painted this room 20 years ago, and this time he completed it with his daughter Lulu. RIGHT: Bern’s ‘Self portrait NM’ is seen. Artist and musician Dan Bern talks outside his Saratoga Springs home on Wednesday morning. 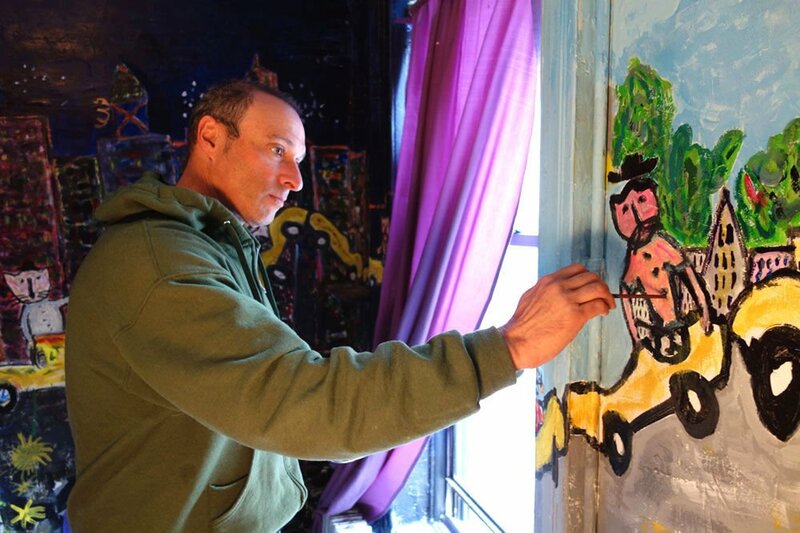 Dan Bern and his 7-year-old daughter, Lulu, painted room 3D at the Carlton Arms Hotel in New York City three years ago. Dan Bern's 2015 album, 'Hoody,' was recorded primarily in Los Angeles at Pehrspace in the Echo Park neighborhood. SARATOGA SPRINGS — Nearly 20 years ago, Dan Bern was staying for a couple weeks at New York City’s Carlton Arms Hotel on E 25th Street when he was invited to paint a room at the storied hotel like so many other artists have done over the years. The way Bern explained it, even though he had never painted before, he believed he would create an impressionistic piece, something like a Monet. But when he got ready to put brush to paint to wall, he realized he didn’t know how to paint. It was a daunting realization that may have stopped others before they even began, but Bern forged ahead and just started painting. Painting over and over and over — for months — in room 3D until he liked it. And that’s how he learned to paint. And that’s how it has always been for this award-winning songwriter, musician, performer, poet and painter. If he is interested in creating something, he just figures it out. Perhaps it starts with the seduction of an idea — a glint or a glimmer that catches him, beckoning him closer. And before long, he is excavating the connective pieces and building a new creation, one nugget on top of the next. He has that deep knowing reserved for those in tune with the rhythm of things greater than what is visible, of things that come from the soul of the earth, from an artist. Until last summer, Bern, his wife Danielle Lesniewski, their daughter Lulu Bern and family cats Scooter and Coco were living in Los Angeles. But for family reasons, they moved eastward this past summer. Still, Bern barely skipped a beat. He’s booked in famed New York, New Jersey, Maryland and Massachusetts venues this spring and summer and he just wrapped up a local concert at Saratoga Springs’ Caffe Lena this past Friday. Bern has a regular songwriting gig with Amazon Prime’s original children’s animated series “The Stinky & Dirty Show.” There’s a new record in the works, and plans are evolving for a marathon art and music event that will highlight his collection of more than 200 portraits he has painted of political, literary and philosophical icons mysteriously appearing in his songs. There are presidents like Richard Nixon and Donald Trump and poets like Frederico Garcia Lorca. 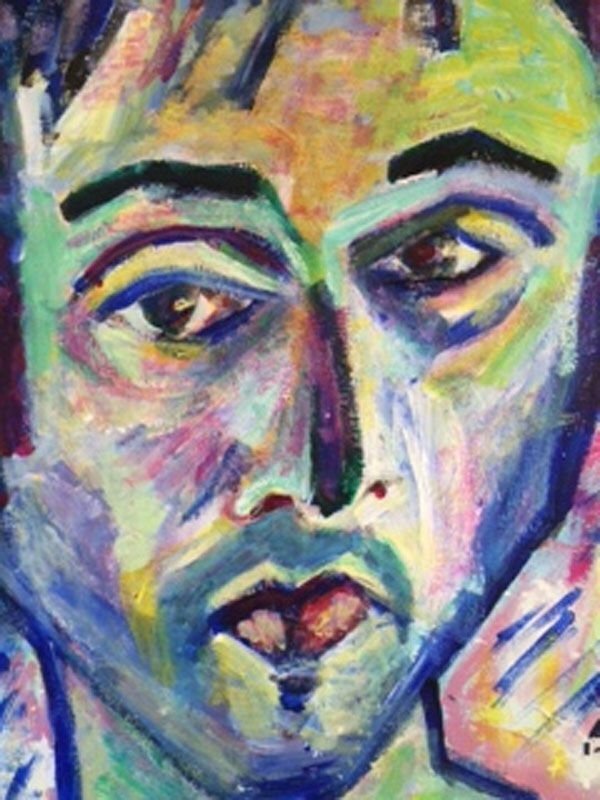 Bern said that at some point, he realized characters in the portraits he was painting were also appearing in the songs he was writing. And that’s the story they created on two walls. One wall featured the city by day, the other the city by night. And on each wall, they created a lively, near madcap tale of the adventures of taxi-driving cats romping through the city streets. Because Bern expresses his creativity in many forms, he likens it to the work of a carpenter. Creating music started when he learned to play the cello at age 6, but it really took off when he learned the guitar at 14. “My first love was the Beatles. But I was one person learning to play the guitar,” he said, adding that John Lennon and Paul McCartney had each other. Since his days of listening and learning — although he’s still listening and learning — Bern has released some two dozen studio albums, EPs and live recordings since his first Sony-distributed CD in 1997. His recordings have featured a host of artists ranging from Ani DiFranco to Emmylou Harris, and he has devoted entire albums to baseball (“Doubleheader”), politics (“My Country II”) and little kids (“2 Feet Tall”). To listen to his songs is like listening to a story told by a combination of Bob Dylan, Johnny Cash and Wayne Hancock. There is love, there is humor, there is irony and deep meaning. His vocals are rich, sometimes raw and always honest. There are times that a Dylan twang emerges, but that is always gone right after recognizing it. With a blend of country, rock, folk and poignancy, his style is unique and powerful. And he has been written about in national publications like The New Yorker, Rolling Stone, Variety, Esquire and The Washington Post. In his newest album, he is working with an orchestrator. In 2016, Bern was honored with the ASCAP Foundation’s Joe Raposo Children’s Music Award. The song “You Can Do It,” a song written for “The Stinky & Dirty Show” that repeats in most episodes, was selected as the children’s song of the year. Working with the show — about friends Dirty, a back hoe loader, and Stinky, a garbage truck — started when someone suggested he take a stab at writing the pilot’s theme song. And now he writes songs for every episode. Currently in season two with such noted voices as Whoopi Goldberg, Jane Lynch, Andy Richter and Joan Cusack, the show has also won several awards. Bern said it is a different process because each song goes through approvals from four or five departments before it is approved for the show. “It’s a lot of fun and a lot of work, but I wouldn’t trade it for the world,” he said. To make it even better, Lulu loves the show. It might seem that his plate is more than full. But just recently his radio station, “Radio Free Bernsteinn,” went live, and he has so much content already programmed into the station that it can loop for over a week before anything repeats, he said. In less than an hour of listening, the station is alive with an eclectic blend of old-time country recordings, folk ballads, Marilyn Manson’s “Sweet Dreams,” the Eurythmics’ “Sweet Dreams,” Dan Bern and in-studio live recordings. Additionally, Bern cuts into the station live from wherever he is that day. “I always wanted a radio station,” he said. It’s hard to say. But one thing is certain: art will remain. Take a look back at local history. Here are the top stories for April 2 from one, five and 10 years ago.